Ekmek Kataifi is a delicious Greek dessert with shredded phyllo and nuts, bathed in syrup topped with pastry cream and whipped cream. Today is my mum’s memorial day, she died 15 years ago but it also coincides with my brother’s memorial as it is six months since he left us, so it’s a very emotional day for me but so long as we remember them, they will always stay alive. May they both RIP. Subconsciously I chose this recipe to post today as my mum loved making spoon sweets (fruit preserves) and she always added some on the puddings she made. This recipe may well be called an Ekmek Kataifi but when I made this recipe over a year ago I had leftover kataifi, so I just improvised and made this recipe without knowing what I was doing. I had heard of Ekmek before but I hadn’t eaten it before and was under the impression that it was a usual kataifi recipe, made flat with cream on top and served with kaimaki ice cream. For those of you who don’t know what kataifi is, it is shredded phyllo. In Athens, there are still some family workshops, where you can buy fresh kataifi, but you can also buy it frozen in supermarkets. The strands of kataifi are pressed to each other, when packed, so before making the dessert, you have to fluff it up by just pulling the strands. Like other kinds of phyllo, if exposed to air for a long time, it will dry out, so when preparing it keep it covered with a napkin or cling film. The classic recipe for Kataifi is a roll, filled with nuts and bathed in a sugar syrup. The kataifi I had was not enough to make the classic recipe, so I used the leftover to make this dessert. I just layered half of it on a baking tin, added the nuts and the remaining on top and then baked it. I didn’t bother to make a sugar syrup because I love making spoon sweets and have never wasted a drop of that delicious leftover syrup. In fact, I always make more than is needed to preserve the fruit, so that I can make use of it in recipes, as it is far better than making a quick syrup. The syrup from leftover spoon sweets is full of the flavour of the fruit used and I am sure that in the future you will be seeing others making desserts using leftover spoon sweet syrups. However, it is very easy to make some simple syrup from scratch, which I have included in the recipe. For those who have already bought my cookbook, I have added a citrus spoon sweet in the cookbook and based on that recipe you can make other citrus spoon sweets as well. This time of the year I usually make citrus spoon sweets which are called “glyka tou koutaliou” in Greek. Last year I had made a Seville orange spoon sweet and this year I made this preserve twice. Before Christmas I made it with oranges, bitter oranges and lemons and just a few days ago, I made more, this time using bergamots as well. I have added a few recipes using leftover syrup in my cookbook but I always give the recipe for the syrup if you want to make it from scratch. I wonder how many times I have used the word leftover in this recipe. Nothing is wasted, so when making the spoon sweet, the zest is collected in ice cubes and frozen to be used in desserts, like this one. On top of the baked kataifi, I added the orange pastry cream mixed with whipped cream, which is very light and aromatic. It is similar to the cream I had made to fill the puff pastry horns, and when it set I decorated it with the remaining whipped cream, some almonds and orange spoon sweet. 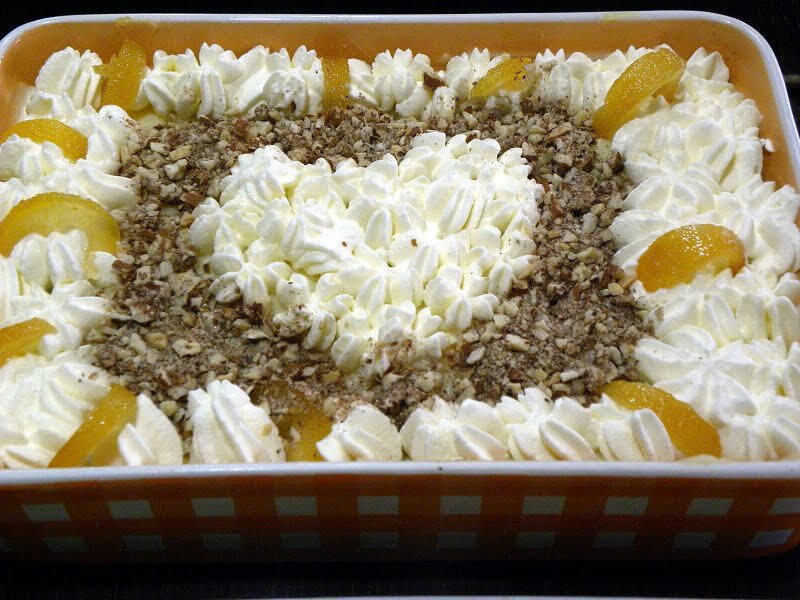 There are no words to describe this delicious, aromatic, fruity dessert, which is so light and delicious. It turned out very light, smooth and rich without being very sweet. My mother used to make a lot of crochets. Although they are now old fashioned and do not use them any more, I like using them in my pictures. Yesterday I had some leftover kataifi again, which was enough to make a small Pyrex of this Ekmek dessert. This time instead of using orange preserve, I used quince. On top of the baked kataifi I added some quince syrup as well as a layer of quince preserve. Then I added the pudding and when serving we added some additional quince preserve on top. I have made this recipe so many times since then, that I have update the post with many recent photos and a video. I have kept the original photo of this dessert as a memento on top. Recently, I made some Limoncello, Lemon Preserve (same as bergamot) and Lemon Curd. I mixed some of the Lemon Curd in the pastry cream and decorated the Ekmek with some lemon preserve. You will find the new recipe at the end of the post. Put all the ingredients in a small pot. Mix to dissolve sugar and bring to a boil. Reduce heat and keep simmering for 5 minutes. Add the lemon juice and liqueur and mix. Set aside to cool and discard the lemon peel, cinnamon and cloves. Heat the butter in a small pan over low heat until it melts. The butter will separate in three parts, foam, oil and milk solids. Skim off the foam with a spoon and use the oil without disturbing the milk solids. Fluff up the kataifi and put half of it in the bottom of a 33 x 20 x 6 / 13 x 9 x 2.5 inches Pyrex. Add half of the clarified butter here and there. Pound the almonds and add the sugar and cinnamon and after mixing, sprinkle on top of the kataifi. (Reserve some for the decoration). Add the remaining kataifi on top and add the remaining butter. Bake for about 30 –35 minutes or until golden. Take out from the oven and drizzle with the syrup. Set aside to cool. Heat the milk reserving 1/4 cup cold milk. In another pot add the corn flour, eggs, sugar, vanilla, zest and the cold milk and stir well with an egg beater, until the mixture is combined. Pour the hot milk to mixture stirring constantly, on the heat, until cream sets. Remove from the heat and set aside to cool. Cover with cling film or mix it every now and then so that no crust is formed on top. Beat the cream on low speed, add the sugar and vanilla, mix and increase the speed as the cream starts to set. Refrigerate until the pastry cream cools. When the pastry cream has cooled, mix a couple spoonfuls of whipped cream in the pastry cream and using a hand mixer whisk them together until combined. Spread the cream over the kataifi. Decorate with the remaining whipped cream and some almonds and orange preserve. A twist to the classic Ekmek Kataifi, with lemon curd. This Lemon Ekmek is smooth, thick and creamy, with a light lemon flavour in the pastry cream. 1. Preheat the oven to 180o C / 350o F (160o C / 320o F), if a convection oven. 2. Put all the ingredients in a small pot. Mix to dissolve sugar and bring to a boil. Reduce heat and simmer for 5 minutes. Add the lemon juice and mix. Set aside to cool and discard the cinnamon and cloves. 3. Heat the butter in a small pan or frying pan, over low heat until it melts. The butter will separate in three parts, foam, oil and milk solids. Let it cool for a while, and skim off the foam with a spoon. You can pass it from a fine mesh. 4. Fluff up the kataifi and put half of it in the bottom of a 17 x 25 Pyrex. Add half of the clarified butter here and there. 5. Pound the almonds and add the sugar, cloves and cinnamon and after mixing, sprinkle on top of the kataifi. (Reserve some for the decoration). Add the remaining kataifi on top and add the remaining butter. 6. Bake for about 20 – 25 minutes or until golden. 7. Take out from the oven and drizzle with the syrup. Set aside to cool. 8. Heat the milk reserving 1/4 cup cold milk. 9. In another pot add the corn flour (starch), eggs, sugar, vanilla, zest and the cold milk and stir well with an egg beater, until the mixture is combined. 10. Pour the hot milk to the mixture stirring constantly, on the heat, until cream sets. 11. Remove from the heat and set aside to cool. Cover with cling film or mix it every now and then so that no crust is formed on top. 12. Mix in the Lemon Curd. 13. Beat the cream on low speed, add the sugar and vanilla, mix and increase the speed as the cream starts to set. Refrigerate until the pastry cream cools. 14. When the cream has cooled spread it over the kataifi. 15. Add a thin layer of whipped cream on top of the pastry cream and pipe the remaining using a star shaped nozzle. .
16. Decorate with the leftover almonds and Lemon fruit preserve. 17. Refrigerate for a few hours before serving. Αγάπη μου, τι γίνεται με αυτή την ιστορία σας. Οι λέξεις, τα έθιμα της γης σας συναρπάσουν μου όλο και περισσότερο. Ό, τι γράφω έχει μια καρδιά, ειδικά σε αυτή την κατάσταση. Γνωρίζω, ωστόσο, ότι ακόμα και αν είστε μακριά κοντά. Εδώ, θα ήθελα να εκφράσω τα θερμά μου αγκαλιά. You are right, Ivy. As long as we remember our departed ones they’ll live in our hearts. This is a great looking pudding! Btw, your mom’s crochets are beautiful. And i really like the sound of that orange pudding. So fruity! This dessert is the best dish to commemorate the passing of your mother and brother; it showcases yet again your mastery of ingredients and the clever way you use everything to its fullest extent; the flavors here are incredible and I would just be swooning! I really like the sound of that orange pudding. So fruity!Flavors here are incredible and I would just be swooning!Thanks for sharing.